Business longevity for the Porter family can be put down to resilience, innovation and a persistent approach to refocus for future growth. The most recent and significant adaptations came in 2017 following the family’s decision to join Mitre 10 and undertake an extensive renovation through IHG’s exclusive Sapphire transformation program. Relaunching in December last year, Porters Mitre 10 Mackay is considered one of the standout examples of what the Sapphire program can deliver for a well-established business operation. 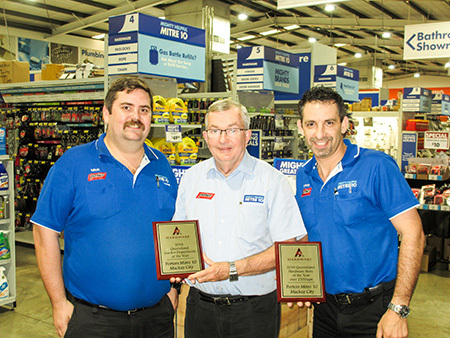 The family’s efforts to transform the Mackay site were recognised by the industry last month with two Store of the Year accolades at the Queensland Hardware Industry Awards. But it was not always smooth sailing. The transformation came after a prolonged economic downturn in Queensland’s Mackay and Whitsundays region from 2013 to 2017. A testing time for the Porters business, in a market that was occupied by three big-box hardware players and numerous niche competitors. 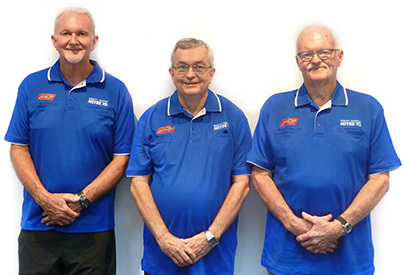 Out of the downturn though, an opportunity arose with senior Porter family members negotiating a deal with another long-time Mackay family, the Woodmans, to acquire their four Mitre 10 stores in Marian, Sarina, Proserpine and Cannonvale. This paved the way for Porters to join Mitre 10, from Natbuild, in April last year. The Porter’s group now boasts 11 divisions including glass and aluminium manufacture, truss and frame manufacture and plumbing supplies. Gavan Porter Junior – CFO, Greg Porter – Trade Manager, and Michelle Thompson – Estimating and Sales Porter’s Manufacturing. “The last few years have been extremely difficult, after going through probably the most difficult contraction we have experienced in 135 years. We had to really dig deep to become sustainable. Not only so we could adapt to the economy, but also remain competitive against the two major players, Bunnings and Masters, that came into the local market. We spent a significant amount of time looking at where we wanted to go and what we wanted to do and that’s when we looked at the Woodman’s acquisition because we are all about regional consolidation,” Porters’ Managing Director, Gavan Porter Senior said. However the Porters are not a family to rest on its laurels, and the Mackay site was placed under a major review by the Board, with plans to restructure through the Mitre 10 Sapphire program, beginning in May last year. A deadline to complete the program by Christmas was set and today both the Porters Group and IHG are highly recognised for the substantial transformation achieved in such a short time-frame. Now that the Sapphire project is complete, Mr Porter said the local downturn is also on the improve and the Porters’ business is moving forward strongly. “It is a combination of what has been done with the store and the economy picking up. Coal prices are improving which is bringing confidence back to the region. This is combined with the restructuring of the business and strategic review that we have been working on for some time, as well as upgrading the store to Sapphire standard,” Mr Porter said. The Sapphire Program takes a whole-of-business approach to deliver Trade and Retail excellence for independent members, the foundation of IHG’s consumer-driven strategy. From price perception, range, layouts and store standards through to trade and customer service, the 30-week program aims to build on what a store is already famous for. For Porters, Sapphire brought the focus of DIY hardware back to the store, and ensured the business continued to expand its core range product. 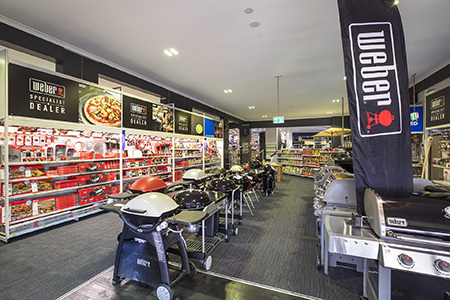 Coupled with Porters’ strength in homewares, home furnishings and outdoor living products, the store is now a destination in Mackay for all things home improvement, DIY projects and home living. Many months of building works and repairs to initially improve the presentation of the building defined the first phase of the Sapphire program, followed by a total re-lay of the store from September until Christmas, Mr Porter said. “The re-layout included new fixtures, significant modifications internally to the store to re-lay it out, as well as the re-positioning of various departments. We worked to a tight timeline, which included critical dates during the implementation phase,” he said. 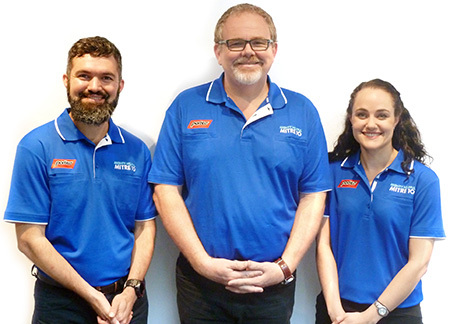 “We then had the Mitre 10 merchandise team working on the core ranging to ensure we had a relevant range for our local customers’ needs. The final presentation was first class in our opinion, to deliver on the branding and the signage, changing to the Mitre 10 blue when we were a significant Porters red. It was a lot of work, but it was a well-planned and organised transformation. We are extremely proud of what has been achieved,” Mr Porter said. L to R: Proud industry award recipients, Mitchell Glover – Operations Manager, Gavan Porter Senior – Managing Director, and Anthony Pace – Porters Mitre 10 Retail Manager. Incredibly the store continued to trade throughout the project, which proved to be a challenge because the store re-vamp required careful management, particularly with many areas of the store requiring isolation while facing the challenging task of not inconveniencing customers. “Another big transformation was the revamping of Charlie’s Café, which today is an integral part of the store and a popular lunch time destination for Mackay locals. The café was totally re-laid and re-painted to enhance the Charlie’s brand as well as positioning the café as more of a draw card for locals overlooking our transformed garden centre. Open seven days a week, we now see both DIY and trade customers come through to the café,” Mr Porter said. “The feedback from customers has been very positive, and we continue to re-build our store traffic month on month. It is a work in progress,” he said. The Sapphire journey and trading under the Mitre 10 banner has been an enlightening experience according to the Porter family. “It has proven to be a good move. Leveraging Mitre 10’s brand name, buying power, business analytics and marketing helps us buy better and align to a national brand to compete against the bigger players. 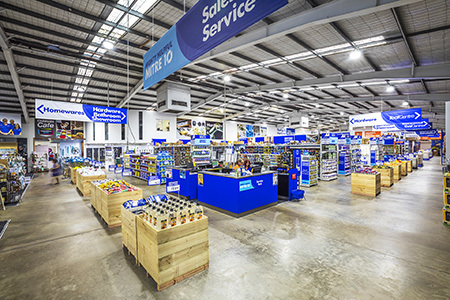 We have always been strong in trade, but Mitre 10 is a brand which has helped us continue to reach a retail target audience as well,” Mr Porter said. 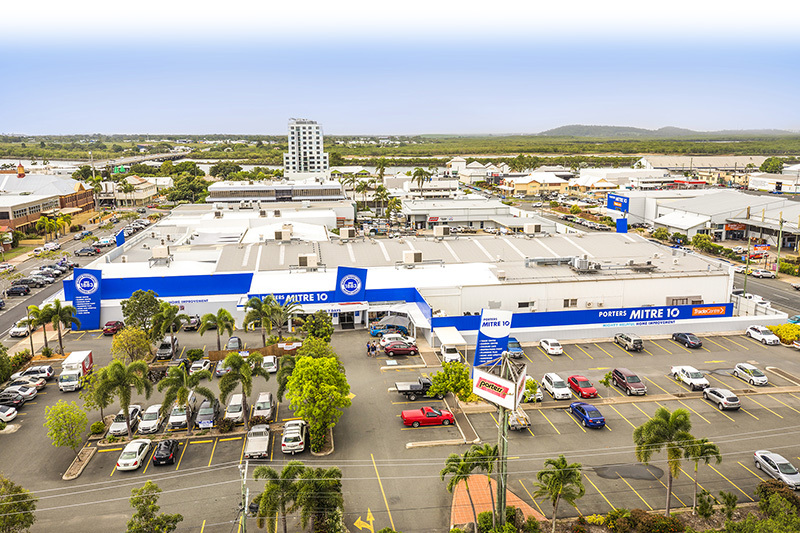 The Porters Mitre 10 Mackay building stands at 7,000 square metres, with a land area of 15,000 square metres, including car parking, storage and unloading dock. Just across the road is the Porters expansive Trade Centre, boasting another large site specifically focussed to trade. Both sites total a combined 22,000 square metres and are considered the hub of the broader Porters business. “Our Trade Centre, at 6,700 square metres, is just across the road. Plans are currently in place for the next Sapphire phase to be completed there. The next project will be an important milestone as the total Porters Mackay business is split 70 per cent trade to 30 per cent retail,” according to Mr Porter. The company now boasts over 250 staff working across the 11 divisions, including fourth, fifth and sixth generation Porter family members, with success primarily driven by the personal service and relationships formed by staff with their local shoppers. 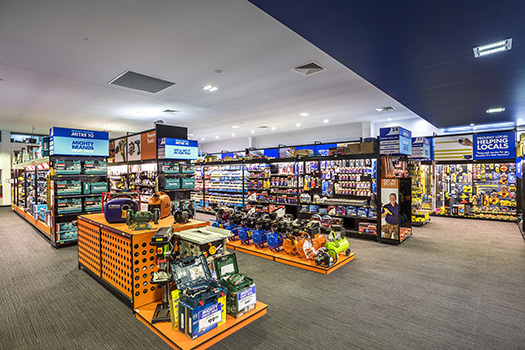 The Mackay site is famous for its expansive range across trade and retail categories, boasting 60,000 product lines, including power tools, home décor, building supplies, plumbing and paint. Porters has one of the largest ranges of Makita power tools nationally. The Porters story began in the 1880s when Charles Porter, a Scottish building contractor, tendered a job out of Brisbane to build the Empress of India Hotel (now Taylor’s Hotel) in North Queensland. 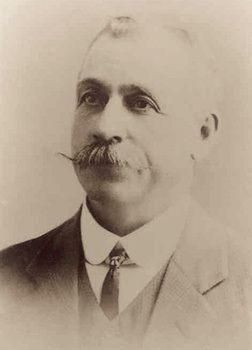 At the time there was nowhere in town to buy hardware, so Charles sourced building supplies from south of Mackay, which was shipped via the Pioneer River. This was when Charles made the decision to set up his own timber and joinery business as a small yard at the Brisbane Street store in 1883. In 1884, Charles formed a relationship with Hyne & Son in Maryborough for timber stocks and this strong partnership continues today. In 1930, a modern showroom was built on Brisbane Street, Mackay, where the current business still stands, followed by a modern showroom built in 1973. The family went on to launch Porters Truss and Frame in 1994, followed by the very popular Charlie’s Café in 1998, named after the business’ founding father. Today, as a sixth generation family business, Porters is proud of its history of strong growth, achieved through the family’s willingness to adapt and diversify to suit the changing economic market. The severity of the most recent downturn came as a surprise given Mackay had always experienced steady growth in its sugar and coal industries, but proved a blessing when the Woodman’s acquisition achieved a positive outcome for both families. 1. Porters Mitre 10, Mackay (retail and trade sites and Charlie’s Café). 2. Porters Mitre 10, Sarina. 3. Porters Mitre 10, Marian. 4. Porters Mitre 10 Proserpine. 5. Porters Mitre 10, Whitsunday. 6. Various specialist sites including Porters Glass & Aluminium (manufacturing aluminium and glass products), Porters Truss & Wall Frame (manufacturing roof trusses and wall frames), Porters Plumbing Supplies and Inspirations Paint. Paul Porter – Director, Gavan Porter Senior – Managing Director and Barry Porter – Chairman of the Board. The Porters business is underpinned by a management team that play to their strengths, a combination of family and non-family members with experts in a variety of fields. Gavan Porter’s son, Gavan Junior, is a qualified accountant and is CFO/Company Secretary. Barry’s son Greg Porter is Trade Manager and a qualified builder with vast experience in business development roles. The Board of Directors comprises of Gavan Senior’s brother, Barry Porter (Chairman), and brother Paul Porter (Non-executor Director), Gavan Porter Snr (MD), two Independent Directors Paul Leitch and Richard Wallace and a Board Advisor, Peter Sheehan. The Executive Management Team is led by Peter Newman (COO). Although Porters Mitre 10 Mackay has achieved a phenomenal amount in just 12 months, the reality is that two Bunnings and numerous niche players continue to trade locally, which means Porters still has plenty of work ahead. “It is a very competitive market. In saying this, we have seen the benefits in joining Mitre 10 to combat this with a consolidated trade and home improvement business, along with the marketing and analytical expertise that Mitre 10 provides. This ensures we have the backing of a national player, like Bunnings, and the buying and brand capabilities to move forward in a market that has been doing it tough. This is also why we have re-structured and are now moving forward with the next phase of our strategic plan,” Mr Porter said. “At the moment we are ticking all the boxes but there is still a lot of planning and key operational issues to make sure we stay match fit to keep us ticking over. The business is positioned where we want it so now we have to maintain and improve it, especially after taking on so much change in a short time. It is a rebuilding program and each month we keep on improving what we have delivered on, but it is a continual process. We’re on the right track,” he said. As part of the rebranding, the Mitre 10 motto of ‘Mighty Helpful’ and Porters’ motto of ‘Can do’ were also cleverly combined.